Small developing states in the Pacific have traditionally relied on imports of fossil fuels. The cost of the fuel, combined with its price volatility, and the islands’ geographic remoteness, are all significant strains on these small economies, write Andrew Jacobs and Michalis Rokas. Andrew Jacobs is EU Ambassador for the Pacific. Michalis Rokas is EU’s Charge d’Affaires in New Zealand. This article first appeared in the New Zealand Herald. In addition, the use of fossil fuels adds to global climate change effects which pose an existential threat to many Pacific communities. It was for these reasons the European Union, the world’s largest donor of development aid, and New Zealand, a major development actor in the Pacific, decided three years ago to join forces and improve prospects across the region. It was evident that fighting energy poverty in a sustainable way and ending over-dependence on fossil fuels would be vital. Sustainable and local energy solutions were necessary, as were notable resources to build them. In March 2013, the EU’s then-Commissioner for International Cooperation and Development, Andris Piebalgs, and New Zealand’s Minister of Foreign Affairs, Murray McCully, jointly hosted the first Pacific Energy Summit in Auckland. It was to raise awareness and gather support for creating sustainable energy capacities in the Pacific. The agreed EU-New Zealand Energy Access Partnership for the Pacific, building on the United Nations’ initiative Sustainable Energy for All, attracted other regional and international partners. The summit resulted in total pledges of NZ$678m (€444m) by the EU, New Zealand, Australia, Japan, the United Arab Emirates, the Asian Development Bank, the European Investment Bank, and the World Bank as well as the private sector. Fast forward to 2016 and this amount was increased to NZ$904m (€592m) of committed investments. Since the summit, the EU-NZ partnership has significantly contributed to improving the livelihoods of Pacific communities. A number of joint projects have been undertaken in Kiribati, Cook Islands, Samoa and Tuvalu. Tuvalu offers a telling example of the work. In 2013 only half of the population had access to electricity. Today it is available to almost all Tuvaluans, even those on the outer islands, and Tuvalu is on course to generate all its electricity from renewable sources by 2025. In Samoa, the largest solar photovoltaic site in the Pacific has been built, consisting of over 8000 panels. Samoa’s renewable generation capacity has more than doubled since 2013, bringing the island state closer to its 100% clean electricity goal by 2017. 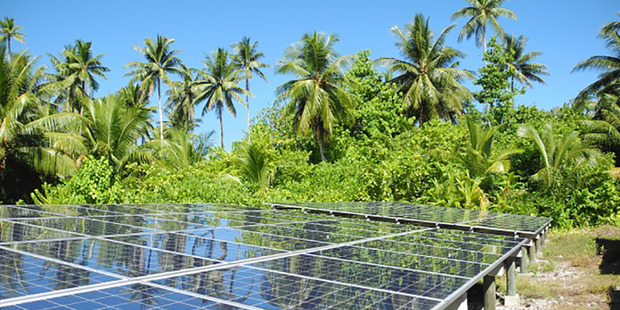 The Kiritimati project in Kiribati will increase the reliability of its transmission network and help to further increase the renewable energy generation capacity. In April 2014 Commissioner Piebalgs and Minister McCully toured the Pacific together witnessing how Pacific countries are taking the lead in switching to renewable energy and providing a moral compass to big emitters. A second tour was undertaken in June 2016, this time with EU Development Commissioner Neven Mimica, underlining the EU’s ongoing commitment. In June this year, following the tour, the EU and New Zealand co-hosted the 2nd Pacific Energy Conference in Auckland. It generated further immense support, with international donors committing this time NZ$1bn (€650m) in investments. Private sector contribution and access to climate finance is anticipated to even increase the available funds. Altogether, the partnership is bringing more than NZ$2bn (€1.3bn) of energy investment over the next decade to the Pacific Islands. Its success lies in local ownership. Rather than setting the agenda, the development partners support implementation of Pacific countries’ own strategies for sustainable development. Equally important are effective pooling of resources and donor coordination. An innovative element is the early engagement of the private sector to secure the economic viability of the projects in the long-term. Given the success of the 2013 energy partnership, the EU and New Zealand decided to go a step further. Just after their second joint Pacific mission in June, Commissioner Mimica and Foreign Minister McCully signed a new Declaration of Cooperation on a Pacific Partnership for Sustainable Development. This expands the partnership both geographically – to the Northern Pacific, and to Tonga and Niue – and thematically to address areas crucial for livelihoods in the Pacific: agriculture and climate change. EU-New Zealand cooperation on agriculture is already starting in Vanuatu, and both partners are confident that cooperation on fighting climate change will prove crucial for the Pacific’s sustainable development. At the same time, ever more international donors and private sector participants will join in as they see this unique partnership working.